'Once And Forever' Turns Familiar Fairy-Tale Ideas Upside Down Kenji Miyazawa is a beloved author in Japan; this book — a reissue of a 1993 story collection — balances chaos and kindness, natural and supernatural to build a world in which anything might happen. 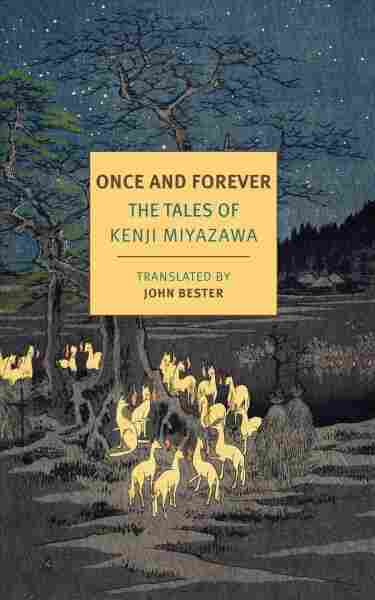 Once and Forever: The Tales of Kenji Miyazawa is the sort of book that makes you very happy there's an English translation, and very curious about the work of translation itself. This collection (a re-release of a 1993 edition, translated by John Bester) encompasses such a range of tones that it's remarkable there's a sense of a cohesive whole at all. Miyazawa — a beloved writer in Japan, whose Night on the Galactic Railroad is considered a modern classic — lives in the details, and when one story is about a flurry of preparations for the expected visit of the Buddha, and the next is a wicked joke about a suspiciously carnivorous restaurant, that's no small task. There's a wildness to these stories, both through the strength of Miyzawa's voice and his use of familiar fairy-tale motifs turned slightly askew, which can feel abrupt on a first read and satisfyingly subversive on a second one. Many of Miyazawa's stories resist tidiness or easy moralizing. There's certainly a sense of morality (at times it even feels like a keenly-felt wound is being lanced onto the page), and every so often there's a tidy tale about an overly-defensive rat that drives its friends away. But by and large, Miyazawa's stories are grounded by a sense of the many intersecting injustices at play in the world, for corrupt police chiefs and carnivorous slugs alike. There's also a sharp awareness of the exploitation of power — "Ozbel and the Elephant" is overtly a parable of capitalist cruelty — and some brutal pragmatism, in that even magical wonders can't do much about the fundamental unfairness of it all. In "The Bears of Nametoko," a hunter laments, "I'd like to do different work, work with no sin attached, but I've got no fields, and they say my trees belong to the authorities, and when I go into the village nobody will have anything to do with me." When the bears start talking back to him, not much about his lot improves; you're not surprised. ... these deftly-rendered stories have careful grace notes amid the everyday energy of a world in which anything can happen, and probably will. That story also features another hallmark of the collection: the 20th century laid alongside more ancient magic. This is a book of stories all well aware they're stories — narrators collect other tales and debate their merits, and protagonists can often sense the narratives they're stuck in. These are also stories in which the unstoppable modern world has a melancholy and a magic of its own; "March by Moonlight" conjures magic along the railroad tracks, and in "Gorsch the Cellist" the hero's subpar cello skills (soon to be fixed via some woodland creatures) are a concern with his local orchestra and the movie theater where he plays. Not every story is a timeless classic; "Man of the Hills" features an eyebrow-raising sketch of the object of the protagonist's empathy — an evil Chinese man (whose dialogue is given an equally eyebrow-raising translation straight out of Fu Manchu) — and not much else. But more often, these deftly-rendered stories have careful grace notes amid the everyday energy of a world in which anything can happen, and probably will. They balance chaos and kindness, the natural and the supernatural, the unsettling and the inspiring; Once and Forever is a fascinating collection from a compelling writer, and will be right at home in any library of short stories or modern folklore.